Mackinac State Historic Parks and Michigan State University Press. Mackinac Island bustles nowadays with 850,000 to a million visitors each year. But for British and American soldiers stationed there, the strategic but remote outpost could be a place of loneliness, spectacular beauty, harsh discipline, even death. Of course, the island’s history far predates the arrival of European fur traders and military occupation. Archeologists have discovered prehistoric fishing camps, and Native American legends tell how the Great Spirit, Git-chi Man-i-tou, created the island. France, Britain and eventually the newborn United States competed to control the island that was so militarily crucial in the Straits of Mackinac. The British under Lt. Gov. Patrick Sinclair built the fort during the American Revolution and occupied it from 1780 to 1796 and again from 1812-1815. “Sinclair spent lavishly constructing the fort, outfitting Indian war parties and on other Indian Department expenses,” according to Phil Porter, director of Mackinac State Historic Parks and author of the new book “The Soldiers of Mackinac Island: An Illustrated History” (Mackinac State Historic Parks and Michigan State University Press, $39.95). However, Sinclair’s higher-ups removed him from command and ordered him to “defend his expenditures,” Porter wrote. When the Americans gained control of the island, Major Henry Burbeck led the first U.S. soldiers into the fort. The U.S. Army stationed over 2,000 soldiers at the fort between 1815 and 1861. Seven officers switched their allegiance from the United States Army to join the Confederacy. And the Fort served as a prison for “three influential Tennessee civilians” whom Union Gen. – and future President – Andrew Johnson had arrested for “treasonous inclinations” during the Civil War. 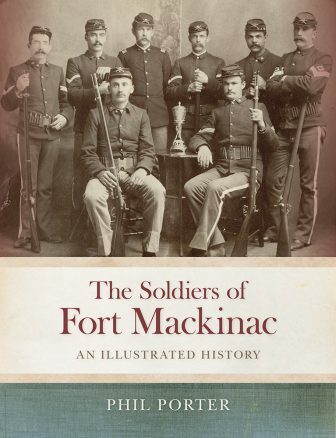 While most of the book’s portraits and short biographies feature officers who served there, a few are about enlisted men, such as Privates Thomas Frost and J. Edward Martin, both posted at Fort Mackinac in the early 1890s. “The army was an attractive option for the growing number of immigrants streaming into the country,” he wrote. In 1864, immigrants accounted for 64 percent of the fort’s artillery company. Over the years, the fort faded in strategic importance, and the Army abandoned it four times between 1837 and 1861, deploying its troops elsewhere — including to Florida to fight the Seminoles and to the Southwest during the Mexican-American War. A decade after the Civil War ended, Mackinac Island became America’s second national park. Soldiers found themselves enforcing park regulations and building roads and trails to accommodate visitors seeking “natural beauty and historic charm, along with the advantage of being a healthy retreat for hay fever sufferers,” Porter wrote. Then came March 1895 when the only remaining squad of troops “marched out of Fort Mackinac for the last time,” he wrote, victims of Army skepticism about its military value and a national cost-cutting movement that closed many forts across the country. Yet some soldiers remain there today. A half-mile north of the fort, the Fort Mackinac Post Cemetery holds more than 100 graves of soldiers and a few of their relatives and local officials. For technical problems, contact CNS technical manager Tony Cepak at (517) 803-6841; cepak@msu.edu. For other matters, contact CNS Director Eric Freedman at (517) 355-4729 or (517) 256-3873; freedma5@msu.edu.